Maximum size: about 25 mm. Identification: This is an elongate-oval species with a few small, conical pustules on the notum. The central part of the notum has fine white reticulations on a yellow ground. The lateral portion of the notum has a yellow marginal line and a solid-white submarginal band. 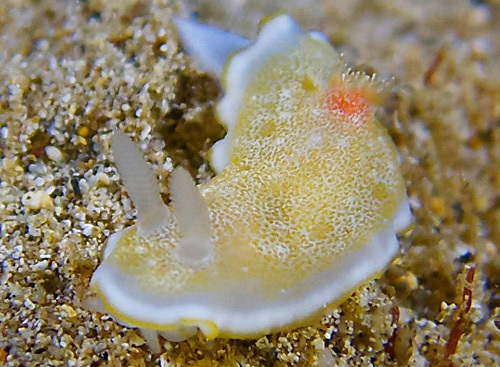 The rhinophores are clear and the branchia are yellow-orange with white tips. Natural history: The one known Goniobranchus(?) sp. #6 was found in a mixed habitat at a moderately exposed site. It was seen at night at a depth of about 7.6 m (25 ft). Photo: Jeremy Bricco: about 25 mm: Koloa Landing, Kauai; March 15, 2016. Note 1: The pattern in the center of the notum is somewhat reminiscent of young Goniobranchus albopunctatus from elsewhere in the Indo-Pacific. However, photos on-line with lengths as low as 4 mm still show the adult coloration (which, otherwise, is very different from this animal). Some other features are close to the G. tinctoria group but without a close match.